Background: The Yi-nao-jie-yu decoction (YNJYD) is a herbal preparation widely used in the clinics of traditional Chinese medicine and has been recently used as an important new therapeutic agent in poststroke anxiety (PSA). The neuroendocrine–immune system plays an important role in PSA mechanisms, although the modulating effects of YNJYD remain unknown. This study investigated the potential effects of YNJYD on the neuroendocrine–immune system in a rat model of PSA. 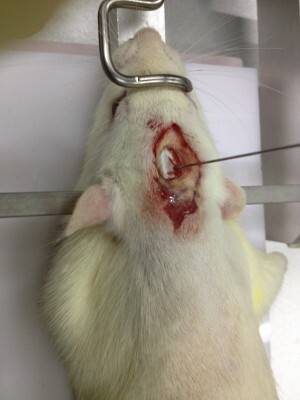 Materials and methods: The PSA model was induced by injecting collagenase (type VII) into the right globus pallidus, accompanied by empty water bottle stimulation for 2 weeks. The sham group and the PSA model group were gavaged with saline, while the treatment groups received buspirone (BuSpar) or YNJYD. Behavior was evaluated with the open field test and elevated plus maze once a week. Pathological changes were observed by hematoxylin and eosin staining. Serum levels of tumor necrosis factor, interleukin (IL)-6, adrenocorticotropic hormone, thyroid stimulating hormone, free triiodothyronine, free thyroxine, IL-1α, and cortisol were detected by radioimmunoassay. Expression of the γ-aminobutyric acid type A receptor (GABAAR) α2 subunit was examined by Western blot and real-time polymerase chain reaction. Results: YNJYD-treated rats exhibited significantly better recovery than BuSpar-treated rats at 21 days and 28 days in the open field test and elevated plus maze. Hematoxylin and eosin staining revealed neural repair in the hippocampus in the treatment groups. Serum levels of IL-1α in the YNJYD group were significantly less than those in the model group and the BuSpar group. GABAAR protein and mRNA expressions were higher in the PSA model group than in the sham group, and YNJYD reversed these effects. Conclusion: YNJYD alleviated the symptoms of PSA mainly by decreasing IL-1α levels and downregulating GABAAR expression in the hippocampus to maintain a neuroendocrine–immune system balance.